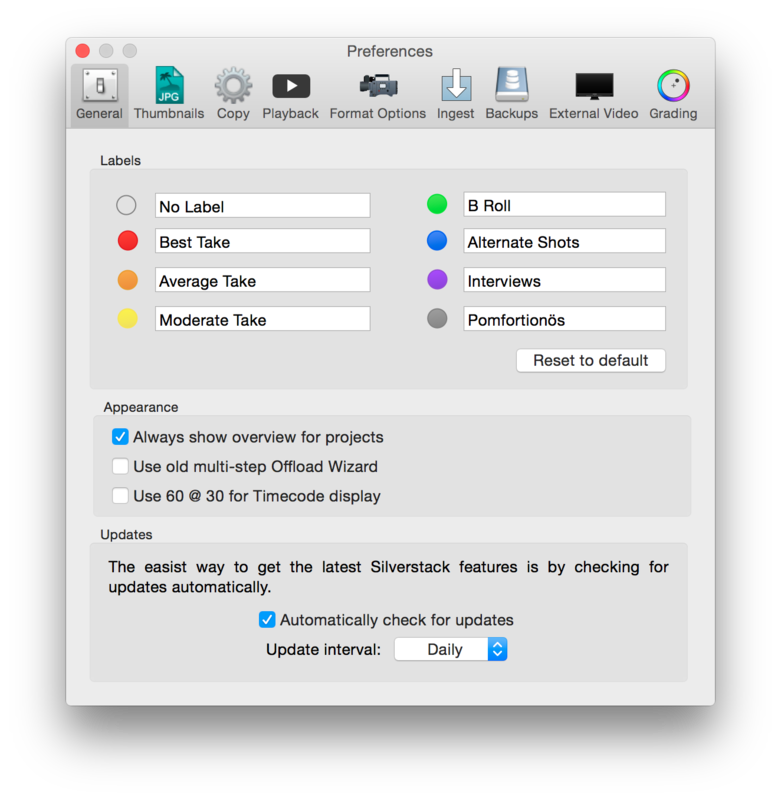 Many general settings for Silverstack can be changed within the Application preferences and by doing so, working with Silverstack may become even easier to fit your workflow. You can also customize the color label naming. 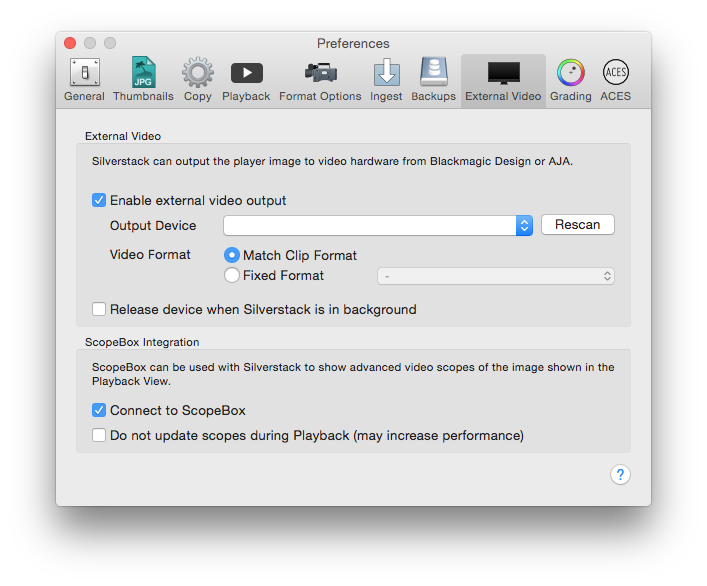 You can choose how often Silverstack should check for software updates. In the “Thumbnails” section you can choose the position in the clip from which the thumbnails are taken. In addition, you can disable the thumbnail creation on Offload jobs to speed up the process and create them afterwards from the «Edit» menu. 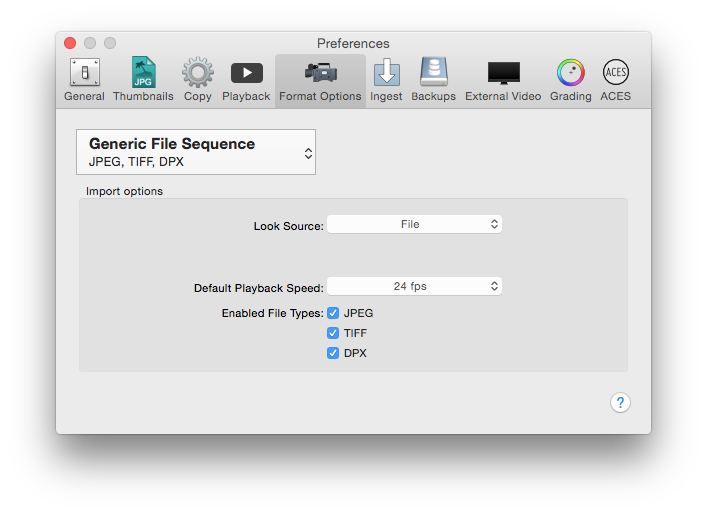 Still frame export options are also available from this panel. It’s also possible to export still frames from clips either with the Original Color, as shown in player or the two images at once. The process is described in the article Still image export. Here you can define all the settings related to the copy process. 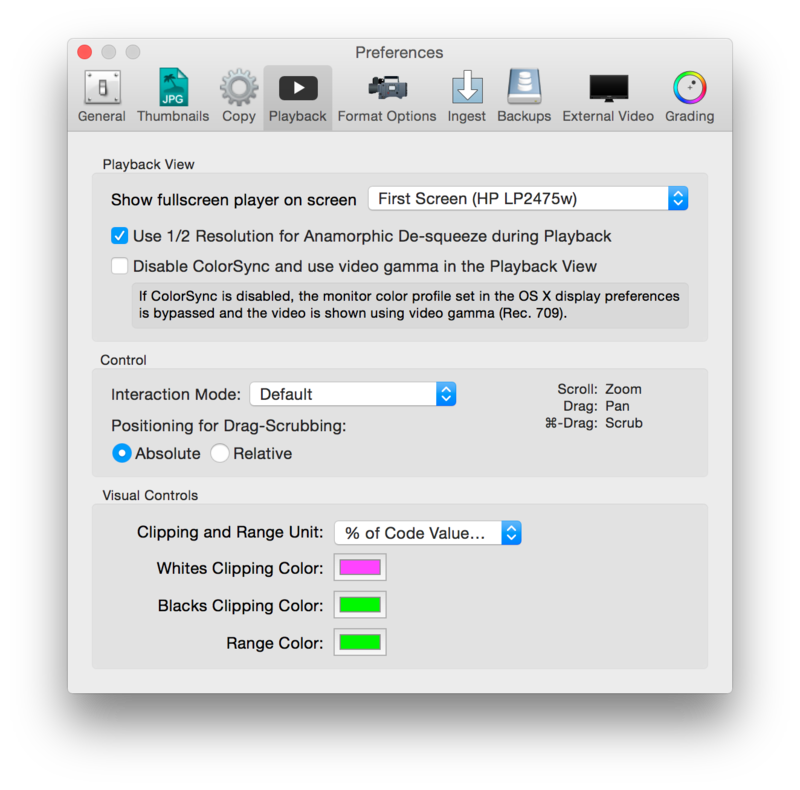 Here you can edit some settings for playback Besides setting the color in which black- and white-clipping regions of a video image are indicated, you can also set the range color and clipping and range unit. In addition, it’s possible to disable the automatic application of ALEXA and AMIRA Looks used while recording. 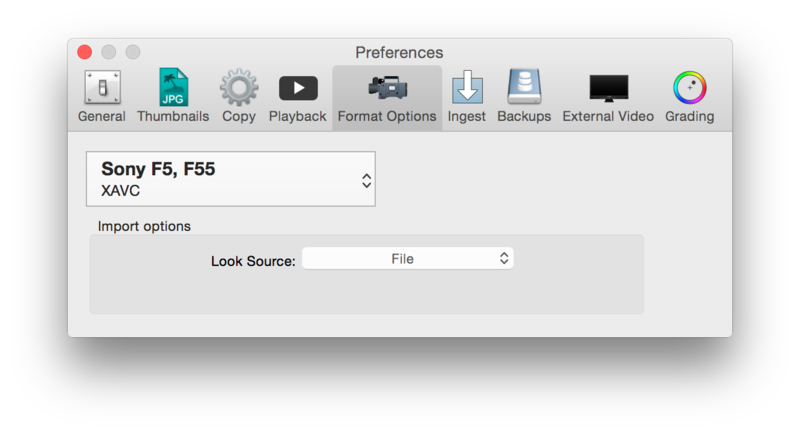 This way the footage will be displayed with the default Log-C to Rec.709 instead of the look. In the “Playback” tab you can also select on which display the Playback Mode will be shown if you have more than one screen connected to your computer. 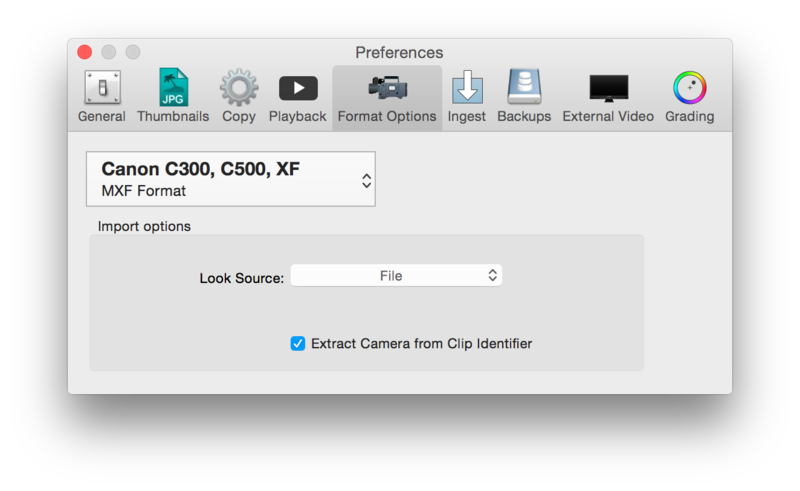 Within this section you can change settings regarding different cameras you may use for importing video clips. You can set those attributes for following cameras/recorders: AJA KiPro and Atomos, ARRI Alexa, Sony F5/F55/F65 XAVC, Canon C300, GoPro Hero and Nikon, R3D and Canon DSLR. The options that are available for defining the timecode are mostly the same for the different cameras. They are useful if you need a different timecode source than the one you got from your camera. 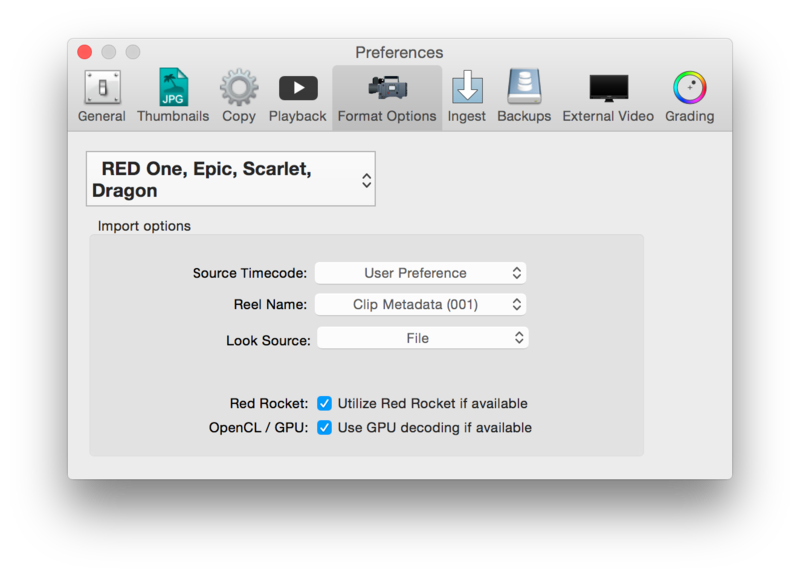 So instead of the camera’s timecode track you can use the Quicktime header create date or file create date. Most times this option is only necessary for the Canon DSLR and GoPRO Hero, not so much for the ARRI Alexa and AJA KiPro. You can set the Look source which will be preselected for the ingested material. 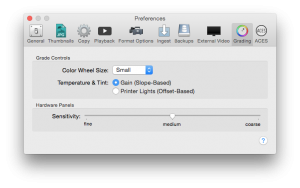 Learn more about this feature in the article Basic Color Control in Silverstack. Furthermore you can let Silverstack extract informations about scene and take from the filenames by selecting the according checkbox. 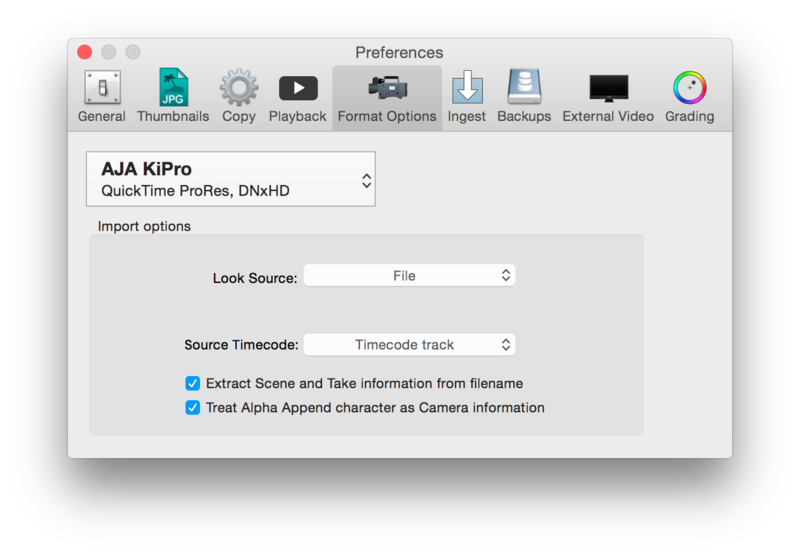 For the AJA KiPro Silverstack provides the opportunity to use the Alpha Append character of a clips name to assign the clip accordingly to a camera. Silverstack provides the option to generate the timecode with different modes. The source timecode can be defined by the Thumbnail Image file, the Quicktime header create date and the file create date. 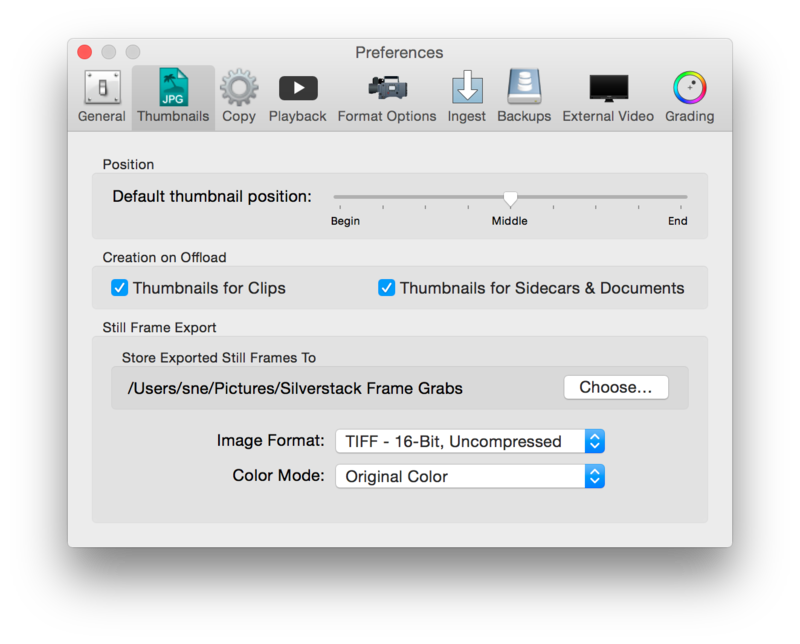 By selecting the according checkbox Silverstack will also copy any THM sidecar files from your Canon camera. For any GoPro Hero and Nikon camera you can set only the option which defines the source timecode either to Quicktime header create date or file create date. The source timecode can be defined as absolute timecode, edge timecode, file create date or by user preference. Use a Red Rocket card if available. Silverstack scans the volumes from which you want to offload. In this tab you can select what kind of files or patterns should be ignored in the ingest process. 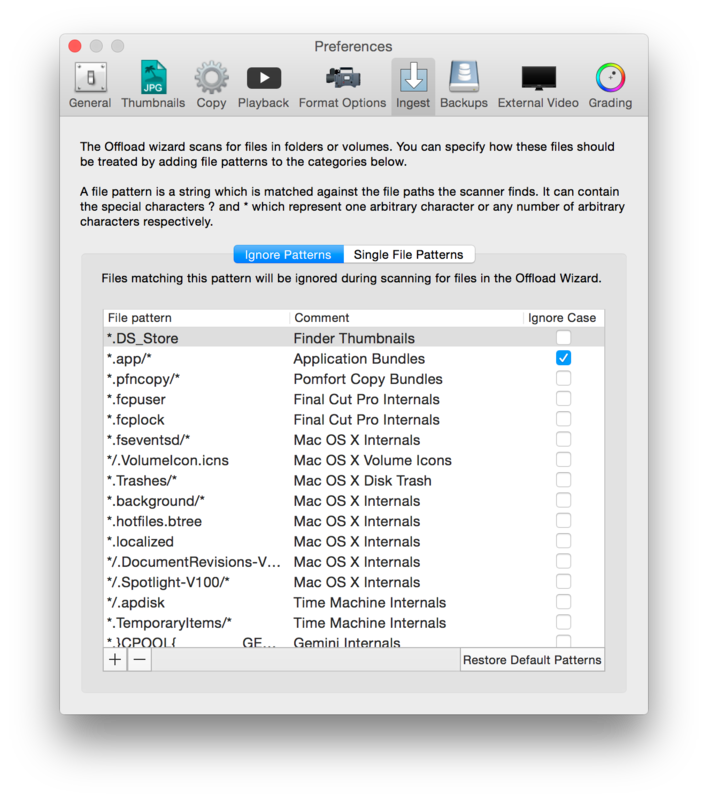 You can add or delete different file types and patterns. 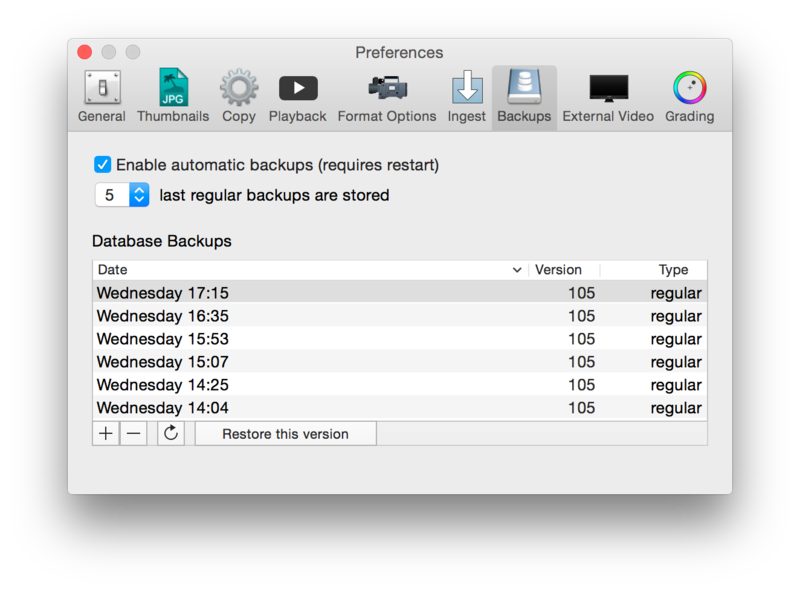 Here you can create and restore database backups of your current and past Silverstack states. Here you can choose the settings for the external video output. Silverstack comes with the option to output an HD-SDI signal via compliant hardware. Learn more about it in the article HD-SDI output in Silverstack. 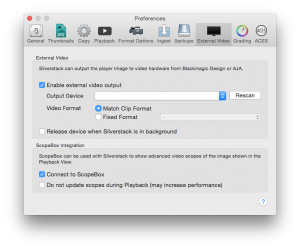 You can use ScopeBox by Divergent Media for software-based waveform and video scopes for Silverstack’s player. 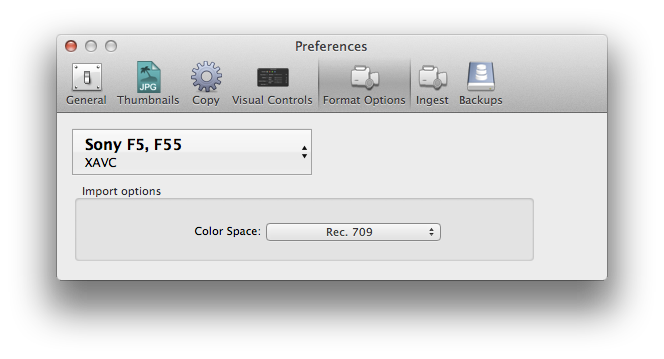 These are the settings for the grading functionalities in Silverstack. Silverstack comes with grading functionalities and an integrated look library. Learn more about it from the articles Grading Controls in Silverstack and The Silverstack Look Library.